Thursday November 11th 19826 Hattie went down town. I wrote Warner McCall and Harty McKinstry. I did some sewing. Soon after lunch went down town by street car and on over the river by Bus. I walked up the old north hill past the house, was at Otts till late PM. They brought me back. Hattie had been to a luncheon. The evening listening to The Radio. Read LeGrands letters. Eight years ago tonight Will was with me out at sister Idas house. The Armistice celebration was on. 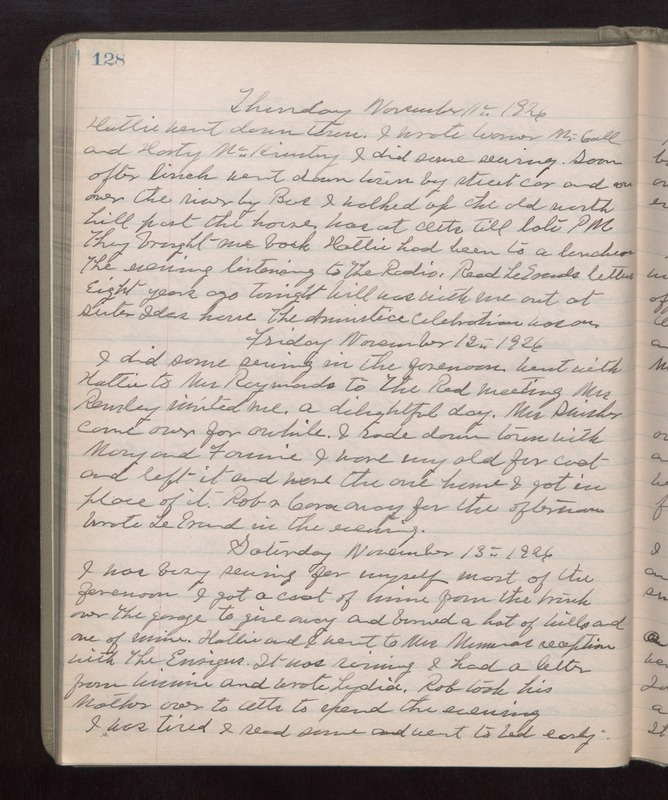 Friday November 12th 1926 I did some sewing in the forenoon. Went with Hattie to Mrs Raymonds to The Red meeting. Mrs Remley invited me. A delightful day. Mrs Swisher came over for awhile. I rode down town with Mary and Fannie. I wore my old fur coat and left it and wore the one home I got in place of it. Rob & Cora away for the afternoon. Wrote LeGrand in the evening. Saturday November 13th 1926 I was busy sewing for myself most of the forenoon. I got a coat of mine from the trunk over the garage to give away and burned a hat of Wills and one of mine. Hattie and I went to Mrs [Mumeras?] reception with The Ensigns. It was raining. I had a letter from Winnie and wrote Lydia. Rob took his Mother over to Otts to spend the evening. I was tired. I read some and went to bed early.